Morgan Fisher (keyboardist of Love Affair, Queen, Yoko Ono, etc.) 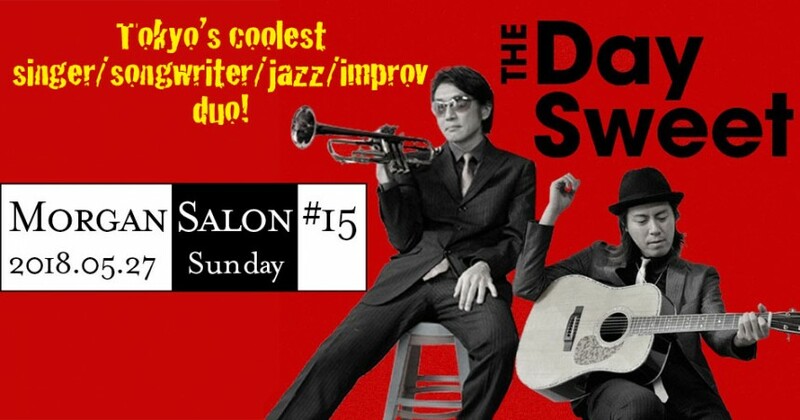 welcomes to Morgan Salon one of Tokyo’s most entertaining musical duos – THE DAY SWEET! He was immediately captivated by their strong, likeable personalities. Vocalist/guitarist Yutaro Ogida is a tremendously talented, soulful singer/songwriter who grew up in New York and London. His partner Gyo Tada is a brilliant trumpeter who played with Japanese stars Kome Kome Club. They have played all over Japan including Asagiri Jam and Fuji Rock. Original songs, from heartfelt to humourous, plus well-chosen covers (in Japanese and in English) and jazzy improvisations. A rich, warm musical evening full of delights. Morgan will add his keyboards to several of their songs. Reservation is suggested, as seating is limited to 30 persons. His intimate venue is just 7 minutes from Shinjuku by train.